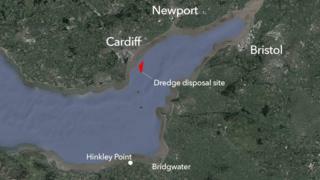 The dumping of mud and sediment from a nuclear plant site will start this week off Cardiff Bay after a delay. Approximately 300,000 tonnes will be dredged from seabed near the Hinkley Point C building site in Somerset. The developer plans to move it to Cardiff Grounds, a licensed disposal site for sediment, a mile out to sea from the capital. Natural Resources Wales (NRW) said the work would start on Thursday despite hundreds attending a protest. The move has met with protests, with some politicians opposing it as well as 7,000 people who signed a petition sent in to the National Assembly. Energy firm EDF, which is behind the £19.6bn plans to build Hinkley Point C, and NRW insist that the mud has been fully tested to internationally agreed standards. They say it poses no risk to human health or the environment and is not classed as radioactive under UK law. However, the campaigners say they're still worried the sediment could have become contaminated by discharges from the old Hinkley Point A and B and want more advanced tests to be carried out. The Welsh Government says that could set a dangerous precedent and that there is no justification for futher testing.